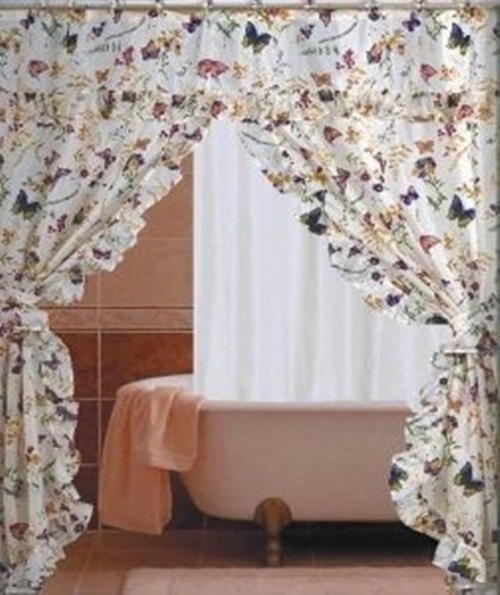 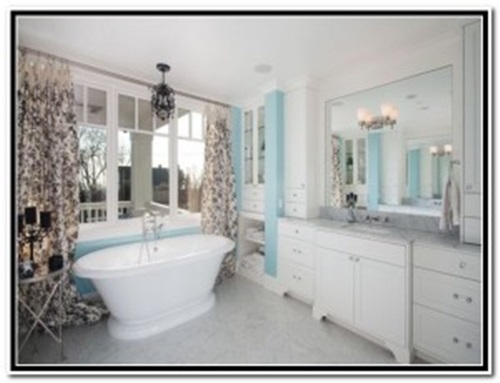 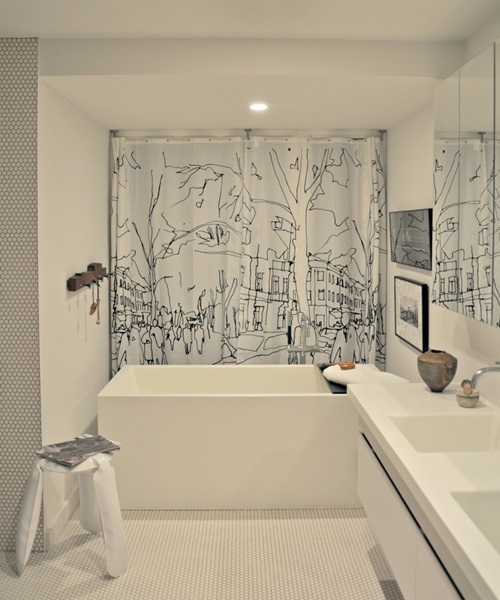 The window curtains are the secret of beauty for any bathroom. 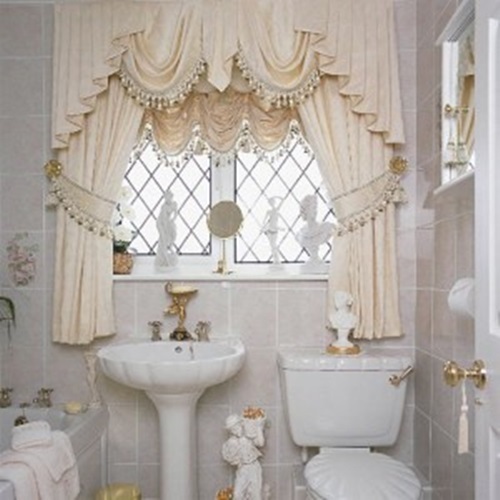 That’s why you have to choose your bathroom window curtain carefully to give you the needed privacy, let an adequate light enter the room, and give an aesthetic look to the place. 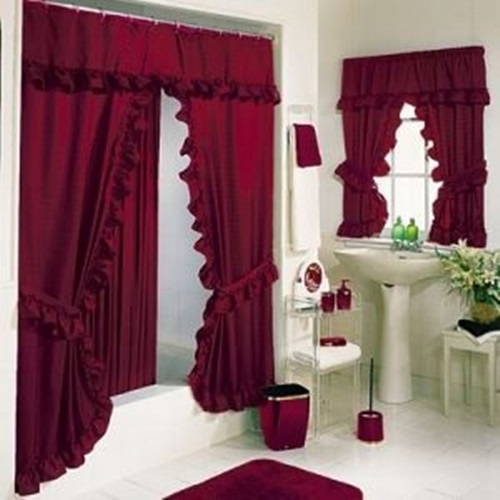 Here, you will find a hint about the different curtains available and how to choose the right one for your bathroom. 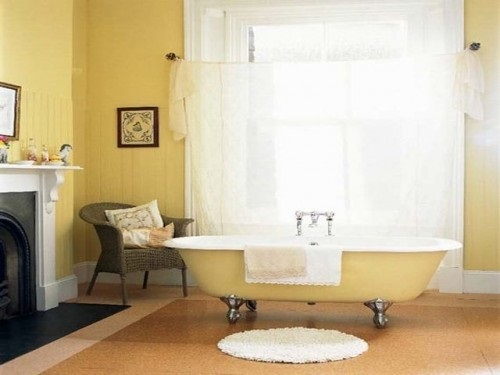 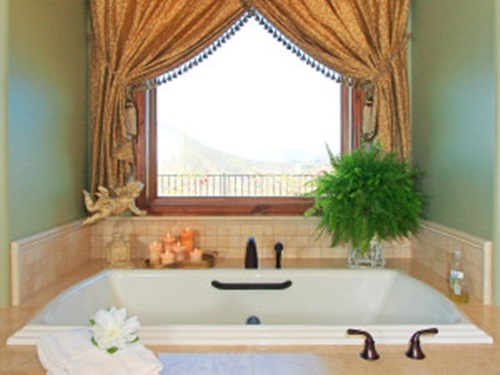 The right curtain should be chosen according to your bathroom’s size, style, and color. 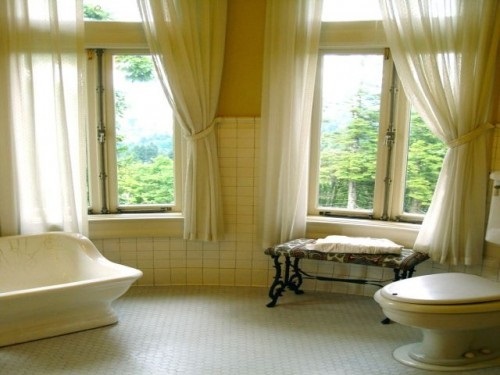 Your bathroom will need a practical window curtain design to resist the mold and mildew resulted from the instant use of water. 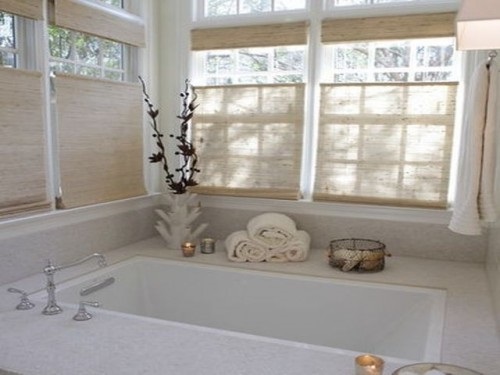 It needs to give you some privacy and hide you from the eyes of your neighbors.You can use different fabrics for your bathroom window curtains such as plastic and vinyl with transparent, translucent, and opaque textures, because they are easy to clean and made of non-toxic materials. 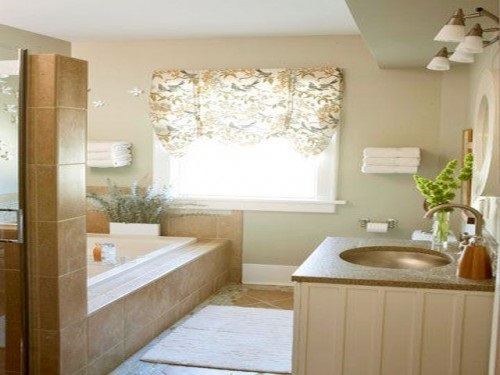 The sheer fabrics or panels are a perfect choice for bathrooms because they come in different designs and colors to go with your bathroom. 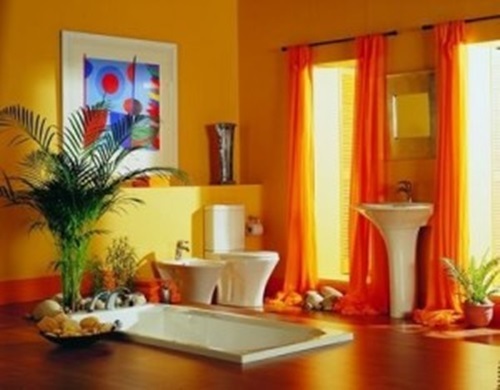 They are able to dry fast to avoid any mildew or dampness. 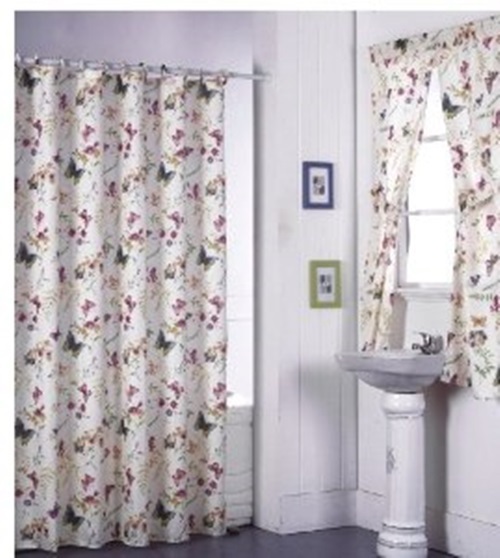 These panels can be replaced by sheers made of natural wood and half cotton curtain. 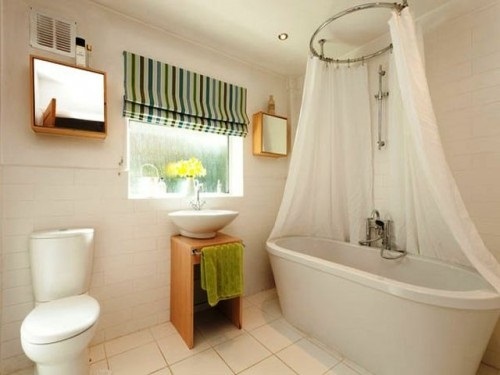 You can use layers of these panels or fabrics according to the degree of privacy your bathroom will need. 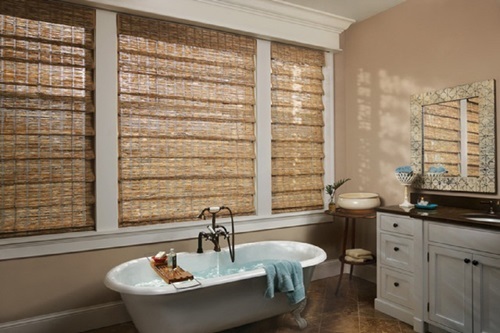 If you need to combine the good look with the privacy, you can install a swage-styled curtain with louvered shutters or blinds. 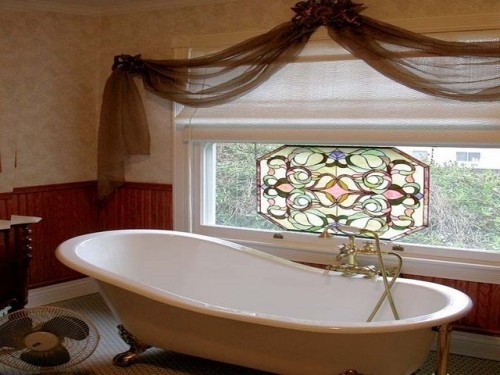 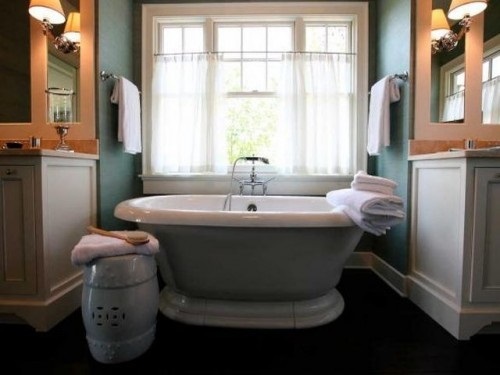 The pull-down, silk, woven, and double shades that don’t reach the floor will reveal the real depth and beauty of your bathroom.If you want to highlight the window to be the focal point, try to use a color that contrasts the whole bathroom and adds dramatic look to the place.You can store your curtain accessories such as crystal ornaments, seashells, and decorative hooks on the valance shelf.